A major signage and wayfinding project, being jointly delivered by Edinburgh BioQuarter’s four public sector partners, is underway. The City of Edinburgh Council, NHS Lothian, Scottish Enterprise and the University of Edinburgh have come together to address the varying needs of people accessing the 100 acre site by vehicle, public transport, cycle and on foot. Over 90 new signs will span the entire site, with three eight-metre-high signposts situated along the A7 Old Dalkeith Road marking out the main entrances and exits. Car parks are being renamed and numbered, linked to these three gates. Further detailed orientation boards, street signs and building signage will also be installed as part of this exciting project. The new signage will greatly assist with wayfinding for people accessing the site. The signs adopt a traditional address-based approach, on-sign information is simplified and focused around road/street/square names to support address finding. It will mean that people can travel more safely to and from the campus, and emphasises the development of joint sustainable travel plans for Edinburgh BioQuarter. The project supports the ongoing development of the campus, while also putting a firm marker in the ground for Edinburgh BioQuarter as we look to promote a campus-wide approach. 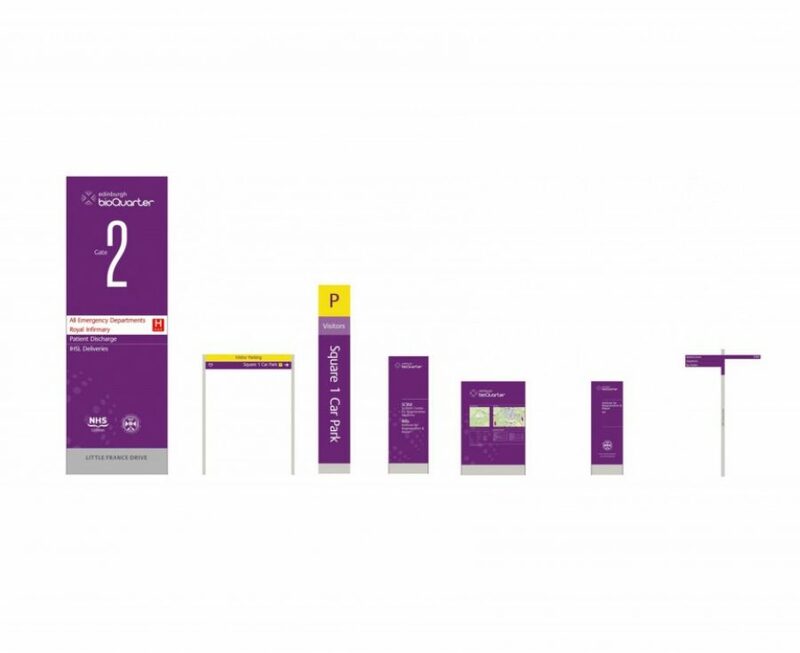 The wayfinding project will address and improve the experiences of people accessing Edinburgh BioQuarter. The campus brings together over 7,500 people, with many hundreds of thousands of patients and visitors attending the Royal Infirmary of Edinburgh each year. 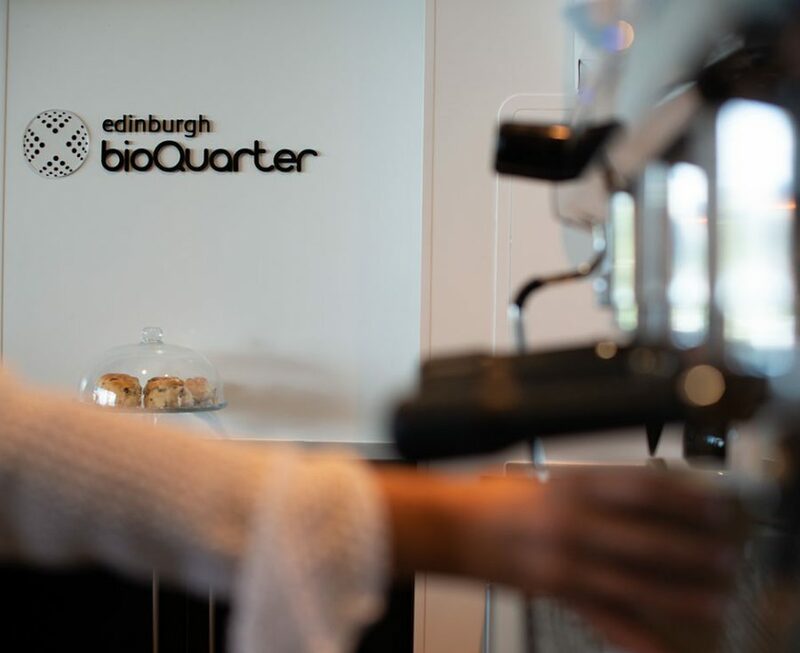 Why are the signs branded as Edinburgh BioQuarter? 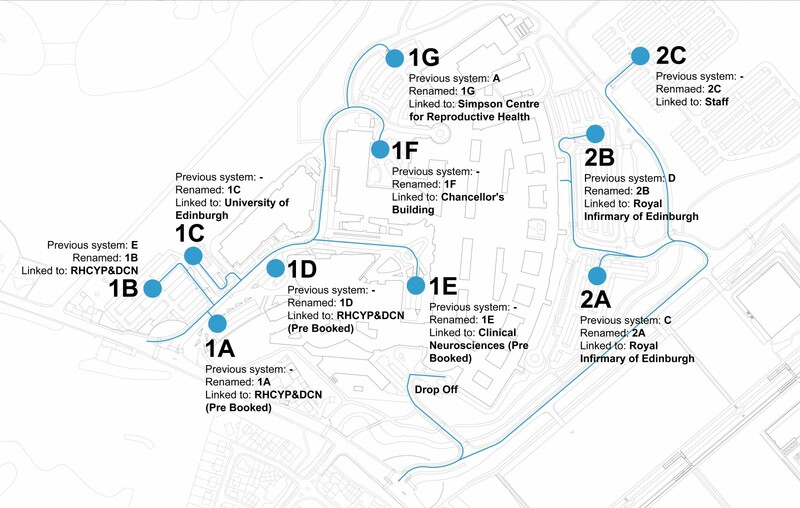 This is a major project and a significant milestone in the evolution of Edinburgh BioQuarter as a leading destination for healthcare delivery and scientific discovery. 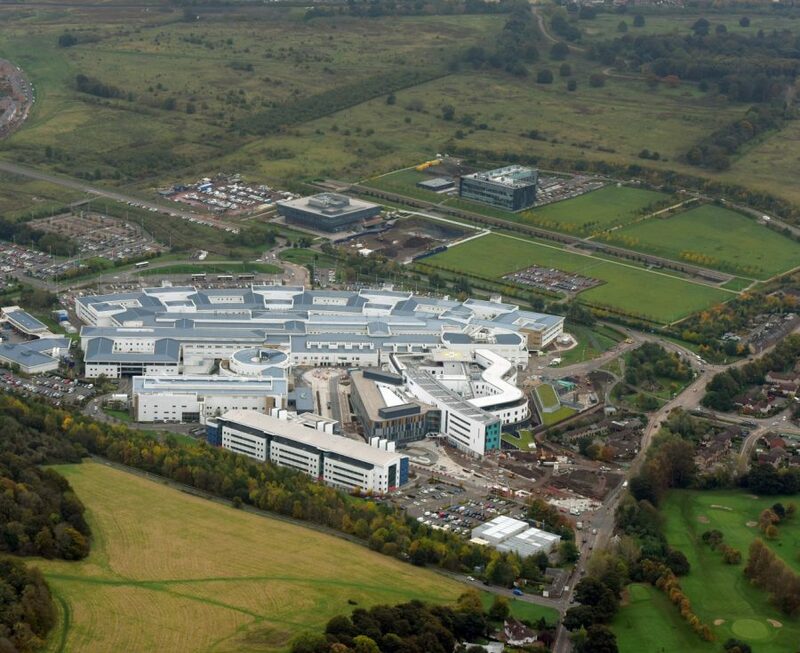 The four public partners involved in Edinburgh BioQuarter want to promote a campus-wide approach which involves building better links between academics, scientists, clinicians, healthcare professionals and life science businesses – all of whom work across the campus. This work also includes improving travel and transport and amenities for people visiting and using the site on a daily basis. Edinburgh BioQuarter and its logos should now be adopted across all signage and will be included in postal addresses across Little France. New site entrance identities have been established to support access to Edinburgh BioQuarter. 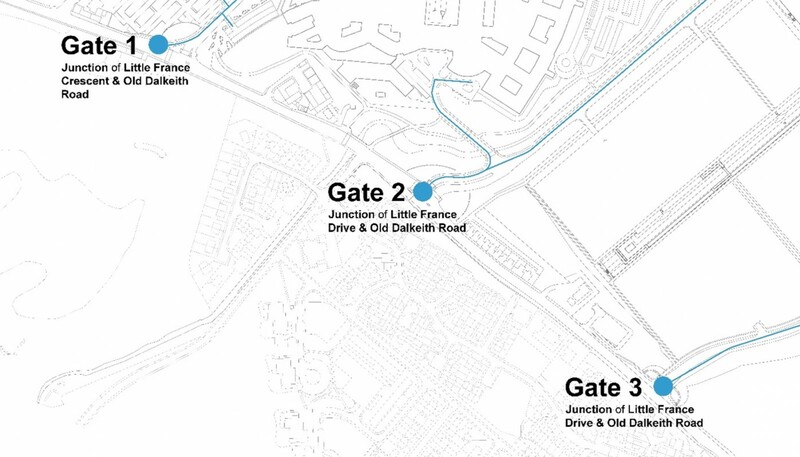 The three entrances to BioQuarter from Old Dalkeith Road (junctions at Little France Crescent, Little France Drive, Little France Road) will be signposted with large totem signage and each identified by a ‘gate’ number. The totem signage identifies the Gate number allowing clear directions to be given. Additionally, the signage identifies the key destination reached by entrances to BioQuarter at each Gate. Directions to any location should be given by the appropriate Gate Entrance, the signage strategy provides wayfinding on this basis. Updated mapping has been produced for the Edinburgh BioQuarter site and can be downloaded here. 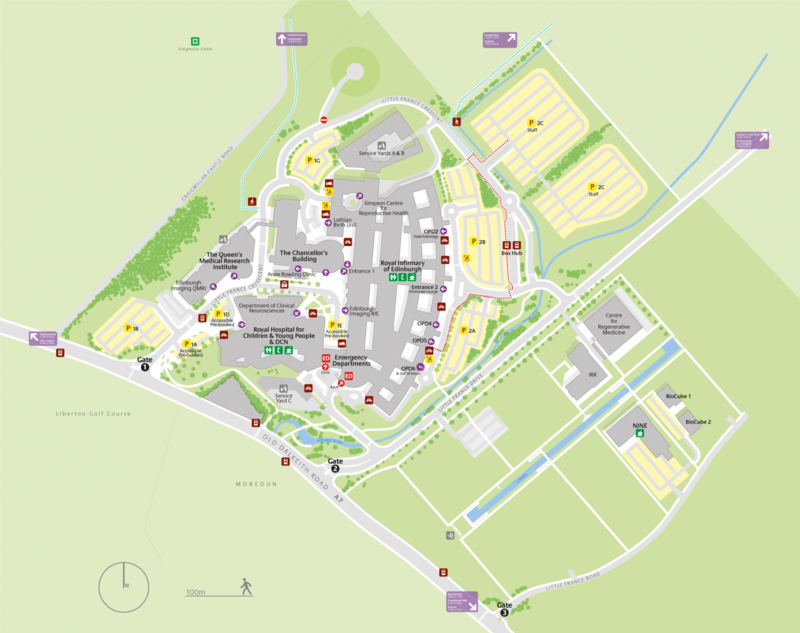 These maps reflect consistent and up-to-date information about the entire campus. Artwork is available in an editable format from the BioQuarter website for use in documents, webpages, pre-appointment information etc. As part of the project car parks are being renamed and renumbered. Car parks are named with a number linked to the gate used on approach and a letter, allocated sequentially, i.e. Car Park 2B is the second car park reached when entering by Gate 2. Our Brand Book gathers our Vision, Mission and story together. It specifies how we speak and write about BioQuarter, and how we use typography, photography and logos. Please ensure you are using up-to-date and official BioQuarter logos by downloading them. For guidance on logo usage, please consult the BioQuarter Brand Book.